Yosemite National Park, one of our 28 scenic and scientific national parks and one of some 180 areas administered by the National Park Service, is world famous for the scenic grandeur of Yosemite Valley and its high Sierra country. It embraces about 1200 square miles with elevations ranging from foothills to alpine peaks over 13,000' high. Such differences in elevation account for the zone-like distribution of the 17 evergreens and 18 broad-leaf trees making up Yosemite’s forests and to a degree its wildlife also. Deer are especially abundant in Yosemite Valley where they, with the bear, are often mistaken for tame animals. They are dangerous and park regulations forbid feeding them in the park. Yosemite Valley was probably discovered by William Penn Abrams in 1849 during the gold rush days. It later came into national prominence through the 1855 reports of Dr. Lafayette H. Bunnell of the Mariposa Battalion under Major James D. Savage, and the extended writings of James M. Hutchings, John Muir, Starr King and many others who worked for its preservation. Because of growing public interest, John Conness, Senator from California, introduced into the Congress in 1864 a bill to set aside Yosemite Valley and the Mariposa Grove of Big Trees as the Yosemite Grant. The bill was passed and signed by President Abraham Lincoln. Here was the first practical application of what was to grow into our great National Park System of today. It was given to the State of California to administer until 1905 when it was receded to the federal government for incorporation in Yosemite National Park which had been established in the surrounding country by Congress in 1890. Yosemite National Park was first administered by the U. S. Army but with the establishment of the National Park Service as a bureau of the U. S. Department of the Interior in 1916, administration passed to civilian hands. Today the visitors’ contacts with this Service are largely through uniformed park rangers and naturalists, whose duties are to protect, preserve and interpret the park under the supervision of the park superintendent. The story of the formation of Yosemite Valley goes back some two hundred million years when this land was beneath the sea. As it subsequently arose out of the sea it was covered with layers of sediments many thousands of feet thick, the remnants of which are seen today as greatly changed rocks in the foothills and on some of the park’s highest peaks. The granites which now make up most of Yosemite National Park’s rocks welled up underneath this old sea deposit as molten rock which cooled slowly as the sea deposits eroded away. As the Sierra tilted westward through three stages of uplift, rivers established courses down this slope wearing successively deeper valleys into the granite. About one million years ago the third and last deep and steepsided “V”-shaped river valley was invaded at separate times by three ice age glaciers which carved the valley into its present “U”-shaped form. The first two glaciers were 3000 to 4000 feet deep and extended as far as El Portal. The third and last glacier, filling only about a third of the depth of the valley, dropped its load of rocks and debris at a point between El Capitan and Bridalveil Fall. This made a dam which backed up the water from the melting ice to form Ancient Lake Yosemite, 51/2 miles long and perhaps as much as two thousand feet deep in the area of Camp Curry. As the lake filled with sediment the present level floor of the valley came into being. The first tourist party came to Yosemite Valley in 1855 on horseback over old Indian trails. It was not until 1874 that a toll road, the Coulterville Road, was built, allowing stage travel to the valley floor. It was followed within a month by a competing toll road, the old Big Oak Flat Road. In the autumn of 1874 Washburn, Chapman, Coffman and Company received permission to extend their toll road from Wawona to the valley, thus completing the road from Mariposa, the first from the south. In 1877 Coffman sold his interests and the company became the Yosemite Stage and Turnpike Company, the first organized stageline in Yosemite, During the 1880’s the Nevada Stage Company ran stages from Stockton to Yosemite Valley via Milton and the old Big Oak Flat Road. Scheduled stage runs over this route ended in 1888, although there was irregular stage coach travel over this road past the turn of the century. 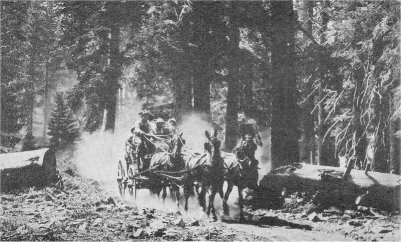 The days of the stage coach were numbered with the building of the Yosemite Valley Railroad in 1907 from Merced to El Portal. Upon its completion the railroad company built a wagon road from the railhead to the Coulterville Road in Yosemite Valley so that horse-drawn stages could carry train passengers into the park. This was when El Portal—the portal—received its name. In 1913 stage companies operating in and to the park established the then famous Horseshoe Route running from Raymond to Yosemite Valley and return to Merced. Another well-known stage circuit was the Triangle Route, operated from El Portal past Big Meadows to the Tuolumne Grove of Big Trees and then via the old Big Oak Flat Road to Yosemite Valley. These several stage routes came to an end with the consolidation and reorganization of transportation and hotel accommodations in the park in 1925 under a corporation that is known today as the Yosemite Park and Curry Company. The transportation division of this company operates bus stages throughout the park and between the park, Merced, Fresno and Lake Tahoe under franchises with the U. S. Department of the Interior, the California Public Utilities Commission and the Interstate Commerce Commission. This division still uses the old name, Yosemite Transportation System, formerly identified with the transportation department of the old Desmond Company. The building of the Merced All-Year Highway in 1926, the growth of mass automobile travel and the subsequent loss of, passenger and freight revenue, led the Yosemite Valley Railroad to abandonment in 1945. In the travel year of 1955 almost a million visitors like yourselves came to the park, mostly by private automobile. For you there are some 217 miles of public roads to various parts of the park and about 750 miles of trails to permit you to enjoy the wilderness features of Yosemite. It is with your pleasure in mind that this self-guiding auto tour booklet has been prepared, that you may have greater opportunity to appreciate, enjoy, and protect the unique scenic wilderness values of Yosemite National Park.